A recently discovered penciled inscription, in the artist's hand, on the back of this famous painting reads: "The instruction of the new ones by Valentine the Boneless." 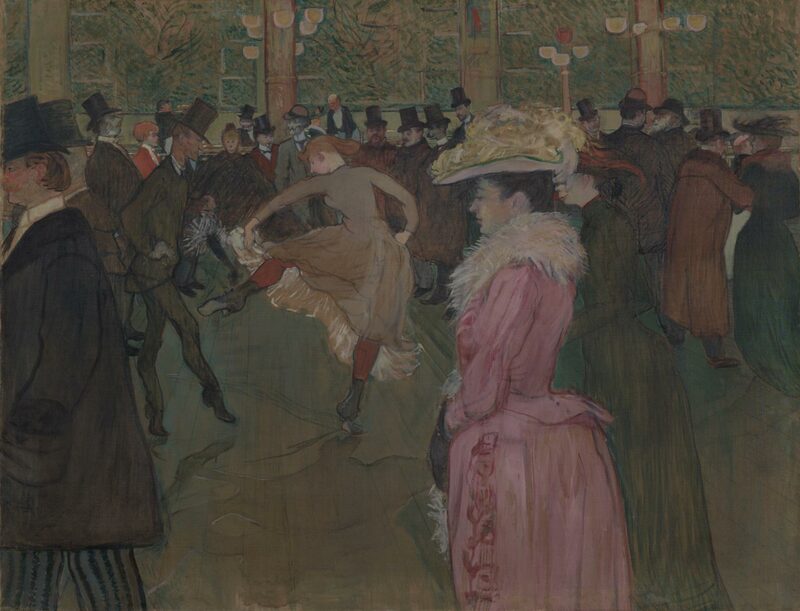 Henri de Toulouse-Lautrec was thus not depicting an ordinary evening at the Moulin Rouge, the fashionable Parisian nightclub but rather a specific moment when a man now known only by his nickname (which certainly describes his nimbleness as a dancer) appears to be teaching the "can-can." Many of the inhabitants of the scene are well-known members of Lautrec's demimonde of prostitutes and artists and people seen only at night including the white-bearded Irish poet William Butler Yeats who leans on the bar. One of the mysteries, however, is the dominant woman in the foreground, the beauty of her profile made all the more so in comparison with that of her chinless companion. It is the latter who expresses better than nearly any other character in this full stage of people Lautrec's profoundly touching ability to be brutally truthful but also truly kind in his observations. Joseph J. Rishel, from Philadelphia Museum of Art: Handbook of the Collections (1995), p. 206. Joseph Oller, Paris, 1890, until at least 1893. With Paul Rosenberg, Paris ; S. Sévadjian; his sale, [as M. S... S...], Hôtel Drouot, March 22, 1920, no. 17; purchased by Arnold Seligmann of Arnold Seligmann & Cie., Paris, until at least 1925 . Possibly with Paul Rosenberg, c.1926 ; with Arnold Seligmann & Cie., Paris, by 1928, to 1934 ; Seligmann estate, as of February 1934 ; sold to Henry P. McIlhenny, Philadelphia (possibly via Jacques Seligmann & Co.), by June 1934 ; bequest to PMA, 1986. 1. Per M. G. Dortu, Toulouse-Lautrec et son oeuvre, vol. 2, New York, 1971, no. P.361. Oller and Charles Zidler were co-owners of the Moulin Rouge in Paris. Zidler, the Moulin Rouge director, placed the painting on permanent exhibit there from 1890-1893. See Richard Thomson, Toulouse-Lautrec (exh. cat., Hayward Gallery, 1991), pp. 229, 246. 2. Clipping (Gazette de l'Hôtel Drouot) and annotation in Getty copy of sale catalogue. Arnold Seligmann was the lender to the exhibition Paris, Musée des Arts Décoratifs, "Cinquante ans de peinture française, 1875-1925," May 28-July 12, 1925, no. 77. 3. Rosenberg is listed as the owner in Maurice Joyant, Henri de Toulouse-Lautrec, 1864-1901, Paris, 1926, p. 268. Possibly a mistake based on Rosenberg's earlier ownership, as Seligmann is documented as owner in 1925 and from 1928-1934. 4. Seligmann loaned the painting to a 1928 Paris exhibition (see also partial label on reverse). 5. The painting was lent to the exhibition "Paintings and Drawings by Toulouse-Lautrec," London, M. Knoedler & Co., February 1-21, 1934, by the Seligmann estate. 6. McIlhenny lent the painting to the PMA in June 1934. He writes in a letter to Martin Birnbaum dated July 17, 1934 (copy in curatorial file) that he had recently acquired the painting from the estate of Arnold Seligmann. In a letter to his insurance agent dated May 6, 1935 (copy in curatorial file), McIlhenny states that the painting was purchased from the dealer Jacques Seligmann (the firm founded by Arnold Seligmann's brother, who died in 1923), who presumably acquired it from the Arnold Seligmann estate.